Bravo is just going to milk the Real Housewives of New York City for all its worth — after not one but two reunion episodes, they dropped a friggin third that included "lost footage." 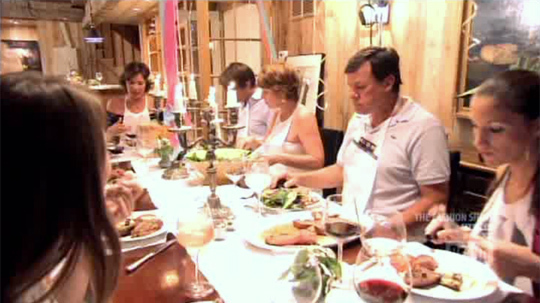 The latest episode was more or less uneventful, except for this little nugget: Countess LuAnn de Lesseps' nieces are budding "product designers" and made "tableclothes," a tablecloth that wraps around your neck to become a bib. And since everyone is so nice, they humored them and ate a meal wearing the ridiculous contraptions. Says an unnamed family member: "So we can eat like pigs. I love it." For royalty, a bib must be so very vulgar. I'm very close to my nieces, the twins, Quinn and Nicole, who are adorable. Nicole is into product design, and her and her friend brought me a gift which is something the two of them and their design team which have produced, which is this "tableclothes." There's a magnetic thing in the back, and you can put it on around the back of your neck, and you have your napkin, or your serviette, right there with the tablecloth... I think it's a really inventive thing.